Our Magnets will bring extra smiles to your kitchen. Each super-strong magnet measures 1 3/4" x 2 1/4" and is made from a clear acrylic clip with a joyful picture tucked inside. Hundreds of images to choose from. Click on any link below. 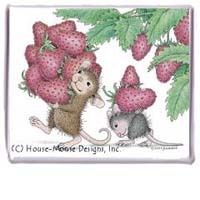 Click on any of the links above to check out our really "Mice" Refrigerator Magnets.